1. Click select button on the left toolbox. 2. Drag your mouse to select an area. 3. 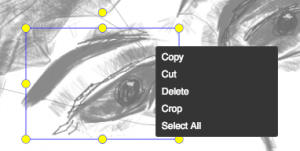 Drag the area to move the selected area or right click on it to copy, cut, delete, crop it.